Hello, everyone! No, I didn't fall off the face of the earth. My art life has had to take a back seat to remodeling our kitchen and updating our house for an upcoming rehearsal dinner for my nephew, to be held at our house. (Really, the dinner is the catalyst for getting our house done). So I have recently made time for a few paintings, and here is the first one - a favorite subject of mine - transparent glass, and the color orange. I'm not sure who wants to get out of here - is it the slices that are stuffed into the jar, or the "free" slices who don't want to be stuffed into the jar? There is a local bed & breakfast inn which is a turn of the century Victorian house - lovely inside and out, and named Christmas House. 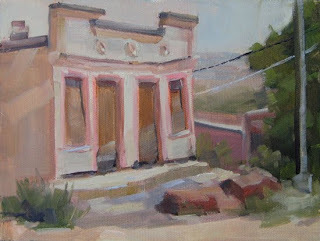 I was there for plein air a couple days ago, and decided on this narrow view of a portion of the front porch. The light was just right. Once again, another breakthrough night of painting. Like last week, I was actually painting - I was free to paint without reservation, and able to be expressive. 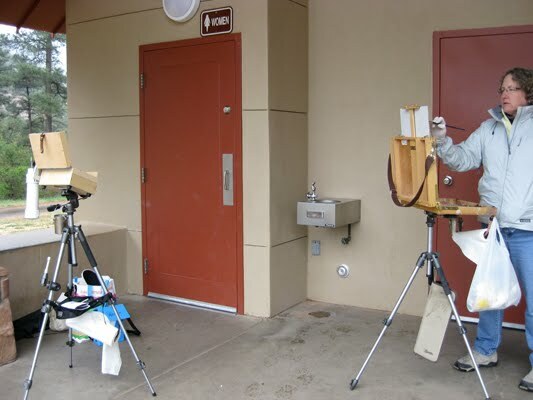 There's really no way to describe the difference between recreating what you see, and really painting. Even Joseph commented on that. I'm excited to apply this idea to other subjects. This is last night's head study. I had such a exhilarating time. I felt that I was really painting, not just faithfully recreating what I saw. There's a difference. I am happy with the finished product, even though the process was way more important and satisfying. Not painting the eyes was only a little difficult for me. When I blurred my eyes, this is what I saw - the eyes were completely lost in the shadow. 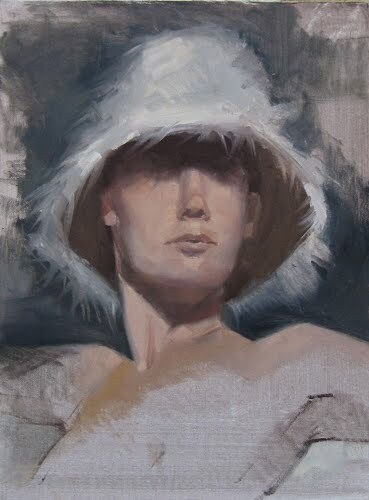 This portrait was done in a monthly model session at a local winery. Gayle Stratford is the facilitator. This is her daughter, Christine. I feel ok about it - but I was a little too caught up in her likeness when I should have been thinking shapes and values. My favorite part is the red dress - straight cad red lite. I think I made it through a valley last night, as I have turned a corner in Joseph's class. This could possibly be my most successful head yet. I am starting to realize that I have to simplify my subject into accurate shapes that are either light or dark, before I start with any transitional values/colors, and long before any detail is shown. This was a two-hour painting, which is why it seems unfinished. I would have liked to get to some of the collar, but I am happy overall. This is the first head study I've done in a while that I actually like. I don't enjoy doing profiles at all, but this was the model's pose, so I just focused on the challenge. Joseph is really pushing me to see all shapes as dark or light, and to eliminate all details until later. Very difficult. But if I have the values and shapes correct, the details don't matter all that much! Yesterday, I had the honor of demonstrating during a fine art charity auction for Learning Ally, formerly Recording for the Blind and Dyslexic. It's an organization that records books on tape for anyone with any reading disability. Artists from around the area donate a work of their art for silent auction. I had just under 2 hours to do this little painting - it was a lot of fun. The lighting on my subject wasn't great, but it all worked out. 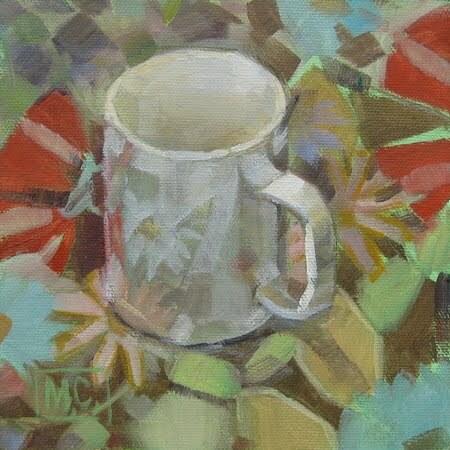 Here's that great little red vase again. I just can't seem to get enough of that pure color. I love picking out the shapes in the vase - it's just never-ending! I'm not crazy about the daisy - I suppose I should concentrate on flower shapes at some point. One thing I do really like about this one is the orange ground peeking through that ties in with the reflection on the cloth. My sister found this little blue creamer in a thrift store for a quarter. It's so vintage and cute! And the egg just fits so perfectly in this tiny glass bowl. The two items seem to belong together - and remind me somehow of living on a farm (even though I never did). This painting was definitely a challenge. We all know that white is never really white, and that if we're looking at something white, we can always find something more white. Same goes for black. The backdrop for this mug is actually a piece of scrapbook paper. I love all the colors and the things going on in it. The white mug kind of looks like a chameleon - just blending in, soaking it all in. 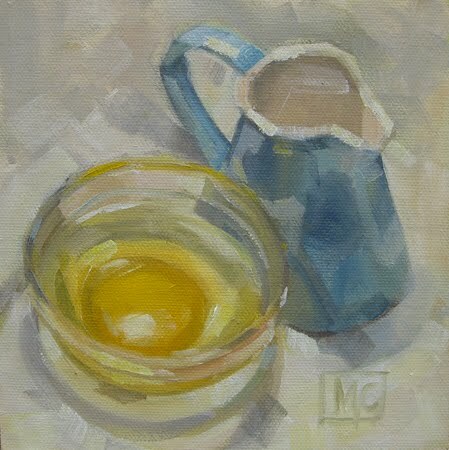 Click on the link above to go to Daily Paintworks to see this and other entries. This is the last painting from the Sedona trip. Our group spent a day in the little town of Jerome, about 25 miles southwest of Sedona. It's like we saved the best for last! The town is about 100 years old - a mining town with many dilapidated buildings. The town is still very much alive, with a bustling population, many quaint restaurants, many shops, and lots of painting opportunities. This building was condemned, and I just loved the shapes and colors in it. While in Sedona, my good friend, Karen Werner, and I shared room. We took turns painting each other, which was challenging and fun. It's more difficult to paint someone you know, instead of just seeing the shapes, colors, and values that, if painted correctly, will resemble the person. 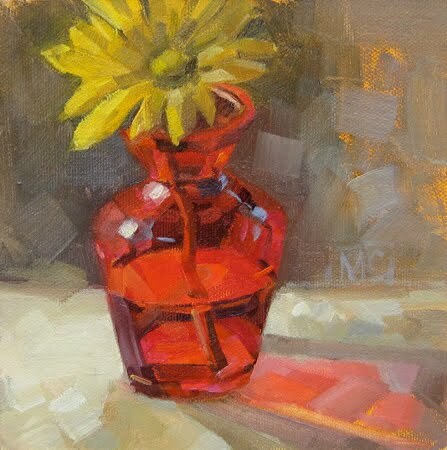 With the exception of the shirt, I used the Zorne palette only, which is white, black, yellow ochre, and cad red. 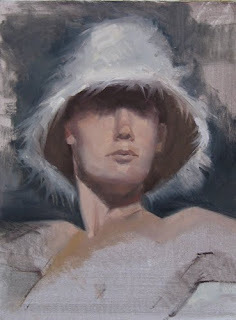 I learned this from my instructor, Joseph Todorovitch. 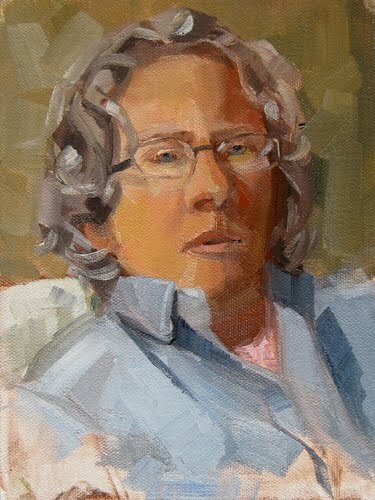 To see Karen's portrait of me, just click on her name. This painting is the result of painting in the cold, (44 degrees) the rain, the hail, and the sleet. And all of this mixed in with intermittent sun. Very difficult. 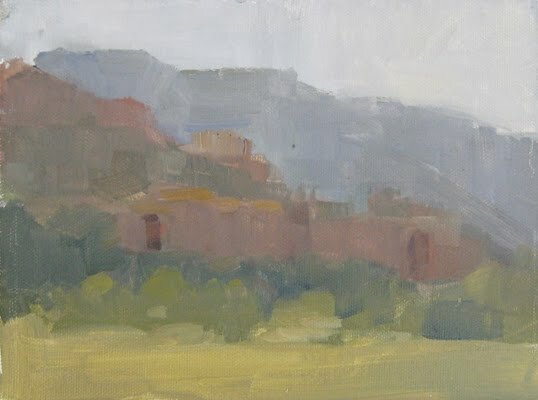 There are a few major things I learned while in Sedona: that I can paint in plein air in any kind of weather; that my new guerilla box and tripod work perfectly for me; to always block in the largest shapes first, and to stick to my original value sketch, and never chase the light. Whew! I'm back from Sedona, having had a wonderful week with my good friend, Karen Werner. This is a photo of her painting, under the cover of a women's restroom at Slide Rock. My easel is to the left. It was so cold this day, that at times I would look at the scene (see it above), load up my brush, go into the heated restroom, and paint. I would also heat up my hands and hat under the hand dryer!